If you missed last week's "State Of The Schools" meeting, here is a summary for your information. This is the power point presentation given to the community. The facts are clear: Fairbanks provides a quality education and has been extremely responsible in spending taxpayer dollars, however, rising fuel costs and unfunded mandates simply require more funds than we currently have. Passing this levy will cost the owner of a $100,000 only an additional $61 per year and will insure that Fairbanks is able to continue the excellent facilities and services you have come to expect from your district. You can click on the pic to view the power point (click on the screen after the link to advance the presentation step by step). 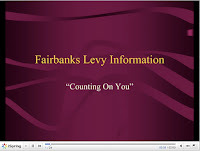 You can also read the entire levy information document by clicking here (pdf document). The "excellent facilities" could use an update, if you ask me. Unfortunately, that would probably require a $20 million levy, but would make Marysville jealous!